This bok choy stir fry is my personal favorite stir fry recipe and the perfect way to cook this awesome vegetable. Bok choy is one of the Brassica vegetables (related to cabbage and broccoli) and is commonly served in Chinese restaurants. It has long white stalks that end in large soft green leaves. It is available fresh in supermarkets and natural food stores. A water chestnut is the small, round edible part of the roots of a grass-like sedge plant. 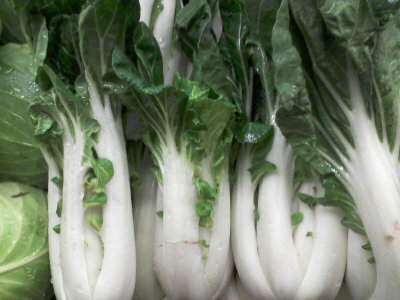 Like bok choy, it is commonly served in Chinese restaurants. Water chestnuts, whole or sliced, are available in eight ounce cans in supermarkets. When preparing bok choy, pull each stalk from the cluster (it breaks away easily similar to celery). Rinse, and slice each stalk crosswise into small u-shaped pieces and small leaf pieces. I prefer to buy whole water chestnuts and slice them (once, lengthwise), after rinsing. Stir fry sliced bok choy and sliced water chestnuts together in high-heat oil at 375 degrees F.
As the bok choy cooks, its leaves turn first bright green and then soften. This bok choy and water chestnut stir fry takes about four minutes of stir fry time.